Teyana Taylor is the latest G.O.O.D. Music team player to have a clothing line drop in association with their Kanye-produced albums. The merch line available here for online purchase, is comprised of T-Shirts and Hoodies ranging in price from $25 to $45. 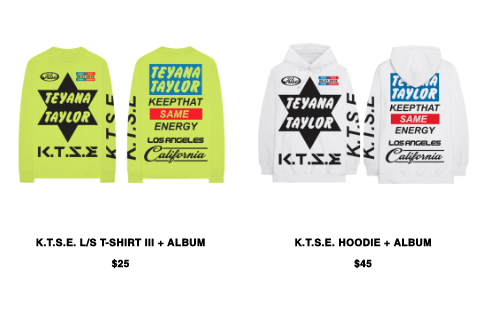 All four pieces take their cue from a culture of semiotic language and imaging, the slogan (album title) "Keep that same energy" is among the recurring design patterns she selected. Her overall aesthetic for the line is familiar to segments of DIY culture, of which "signage" is most relevant. Kanye's cross marketing influence has seen "learned" individuals like Nas do the improbable and go commercial, the Nasir merch being the more esoteric of the two. Check out hubby Iman Shumbert striking a pose in his longsleeve tee, while the World awaited her album. Musical purists were quite furious with Kanye's prioritized dropping merchandise while the albums exceeded sat on the conveyer belt. An Instagram post by designer John Geiger seems to suggest there were hats and t-shirts passed around at Teyana's listening party in Los Angeles that remain off-limits for the time being. Starting with the long sleeve t-shirts priced at $25. ..and a hoodie at $45.